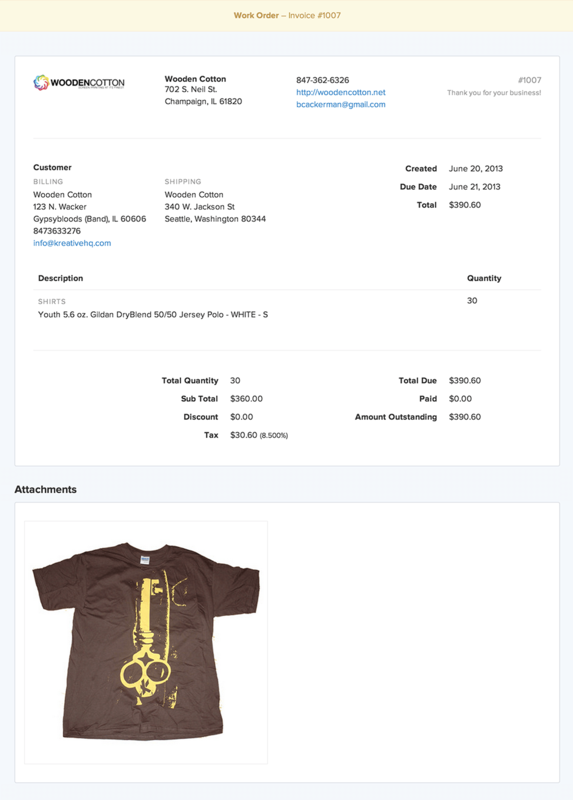 Printavo - Using Printavo - Simple screen printing software to help manage your shop. Shop management software in the cloud. A day in the life of shop owner, Chris, using Printavo. Read through and click on features to understand how Printavo can help your shop. Chris’s just waking up and logs into Printavo on his iPhone. He can see all the orders due for the week and starts to attach tasks to invoices for his team to complete. Just now arriving at the shop, Chris sees sales reps already entering and editing quotes in Printavo all at the same time. 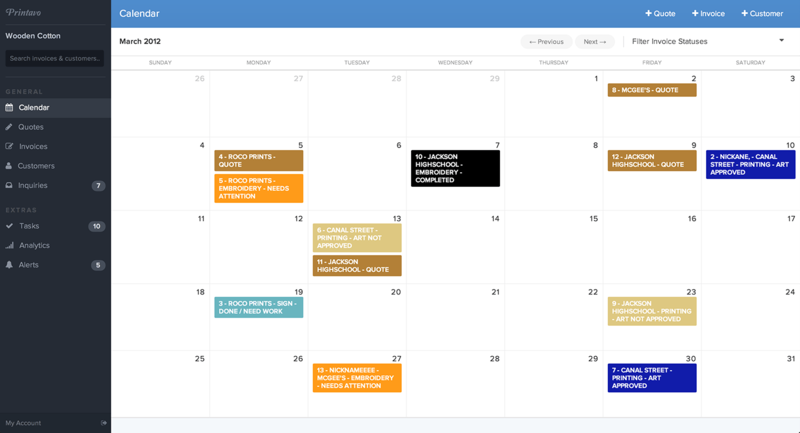 He opens his laptop and views the full calendar for the month. He filters it to only show Invoices without Artwork Approved and drags a few invoices around to change their due date. Jane, one of Chris’ sales reps, is duplicating existing invoices and changing around a few details. 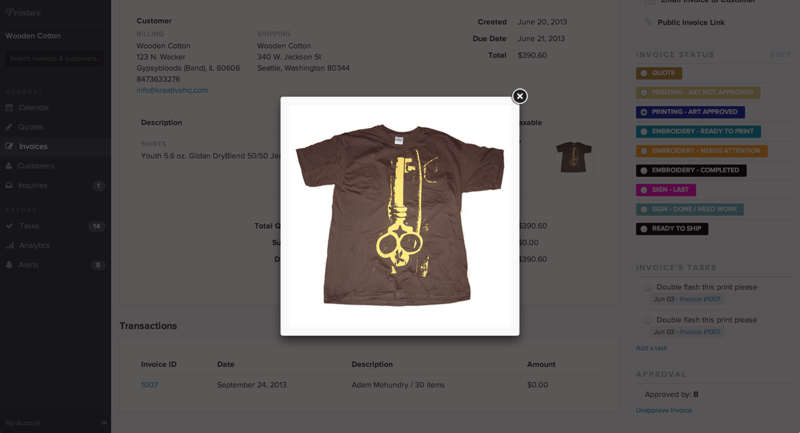 Since Printavo has a product catalog of 70k+ products, entering them into line items is quick. Jane can also upload her own product list. She requests a 50% down payment on Invoice #1068 via email. The customer securely pays with their credit card (via Authorize.Net or PayPal). 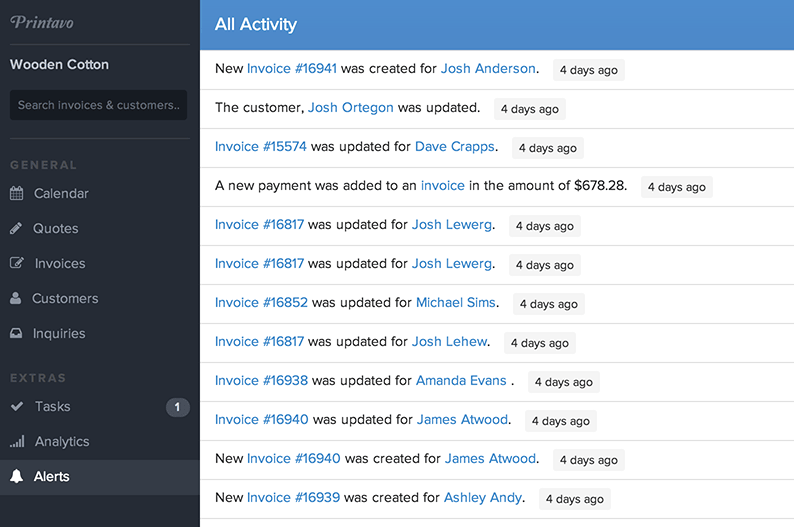 Chris is able to search for invoices quickly to find customers and invoices he needs. He views the Activities feed page to see a feed of everything thats been created and updated with a time stamp. This helps since he has six employees working in Printavo at the same time. As Chris leaves the shop to pick up his kids from school, he checks invoices, tasks and activity from his iPad. Just another day using Printavo! Noah, Chris’ Art Director is busy attaching mockups to invoices. Each line item has separate attachments and unlimited space to use. He’s finished a quote and uses an email template to request approval from the customer. 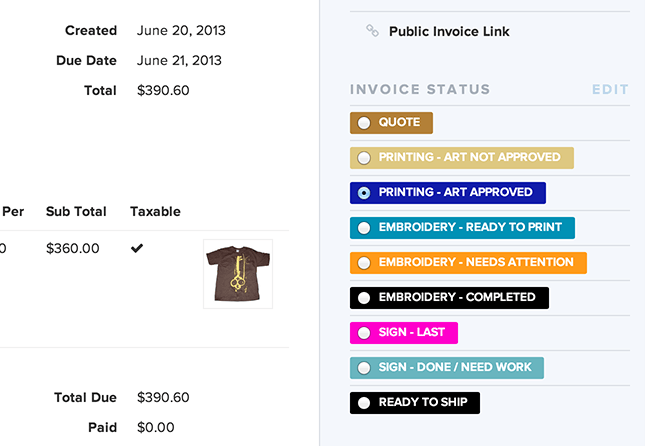 After receiving an art approval confirmation email, Noah changes the invoice’s status to Art Approved. He prints a copy of the work order to send to the supplier and checks off that task on the invoice. Noah lastly copies the Public Link to the invoice and shares it with the customer and team again to get ready to print. Chris starting to get hungry since lunchtime is around the corner. He knows his accountant will be calling later any minute about taxes for this quater though. 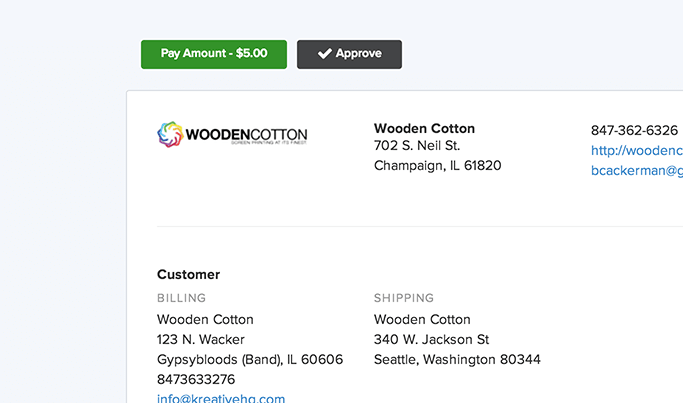 Good thing Printavo syncs invoices, customers & transactions into Chris’ QuickBooks Online account in real-time. Chris creates a free user account for his accountant and is on his way to lunch! 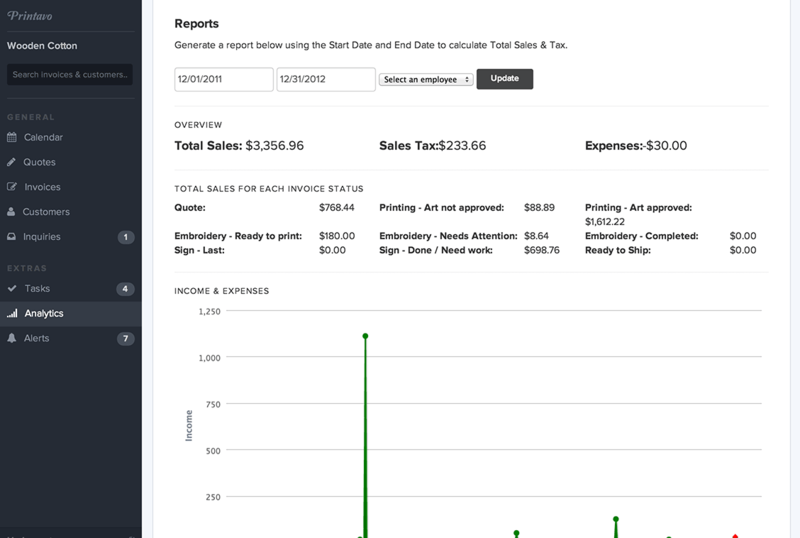 Time to pay out commission to offsite sales reps. Chris goes to his Analytics page, selects a starting and ending date, a sales reps name, and can view total sales for each invoice status for that rep.